SYNOPSIS: In the same way I love really bad Horror and Sci-Fi films for being "so bad they're good" I love Spunky and Tadpole the same way. Know for their poor animation and loopy surreal stories they are nonetheless very entertaining. The character voices are brilliantly bizarre. If you've ever seen this show you know what I mean - and if you haven't here's your chance to catch up. The stories move along at breakneck speed too! 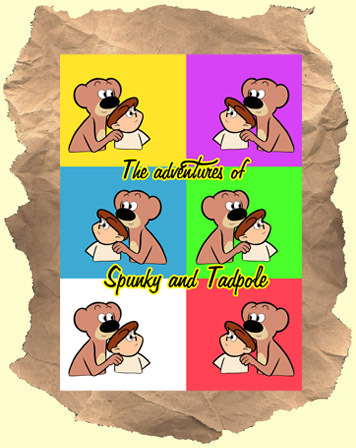 For the record "Spunky" is an adventurous boy and "Tadpole" is a slightly puffy looking bear with human qualities (he looks like "Boo Boo Bear" crossed with Jimmy Durante). These cheaply drawn Hardy Boy wannabes investigate various mysteries that take them to the Wild West, a haunted house, the Congo, outer space and even the moon! 3hrs & 35mins of animated fun.